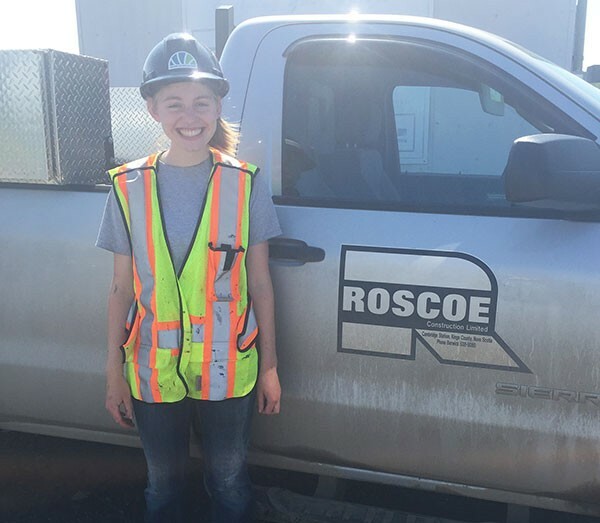 16-year-old Grace Hall never would have given a second thought to working in construction. But that was before her experience working with Roscoe Construction Ltd.
Hall had heard about the co-operative education opportunity through Michelle Peters, the Building Futures for Youth lead for the Canadian Construction Association of Nova Scotia, or CANS. Building Futures for Youth is a summer youth program funded by the Nova Scotia Apprenticeship Agency, involving partnerships with the Department of Education and Early Childhood Development, Regional Centres for Education, the Nova Scotia Community College and CANS. Peters came in to speak to Hall's Grade 10 class at Central Kings Rural High School, and right away Hall knew she wanted to participate. The program sounded amazing, Hall thought. She would be able to earn the required credit for her Options and Opportunities class, plus have paid work for the summer. "The application process wasn't bad. You filled it out, needed two references, said why you were interested and which jobs you would do," says Hall. "I picked a couple that sounded intriguing like a blaster or crane operator, but it turns out you need years of experience to do that." Hall wanted to stay local, and the site wound up being five minutes from her house in Coldbrook. Hall couldn't have been happier with her position as a general labourer in the carpenter trade with Roscoe Construction. Hall's placement required a two-week course at NSCC, where she took online safety courses and watched videos demonstrating hands-on work from how to hammer a nail, to working safely in an environment where there are beams hanging above. All of it was related to stepping onto a construction site, and maintaining general safety, in preparation for the summer. Finally, Hall would participate in a five-week on-site pre-apprenticeship work placement once her safety training was complete. "The biggest challenge was being in an environment where it was mostly men on the construction site. There was only one other female. I've never been in that sort of male-dominated environment, and I'm actually glad I was put in that position. It gave me experience of what it was like," says Hall. Hall goes on to say how comfortable she was right off the bat. Her workmates were extremely supportive of her, and they wanted her to succeed. "All of the people I trained with at NSCC were determined for me, and it made me want to go. Once I started working on the site, I made so many connections and relationships—I even stopped in at the site after my five weeks to check in," she says about meeting new people and stepping outside of her comfort zone. Now that she has worked in construction, Hall says that she would consider a position in management. The whole experience was eye-opening for her, even if she doesn't pursue it, because it taught her the challenges of working a physically demanding job, and what jobs are available to her. "It was different from school. It was a different kind of work – it was physical, rather than sitting in a classroom," Hall says. "I liked working on the site because it's mainly common sense. In school, it's textbook work and you don't get to think outside of the box as much. The hands-on experience on the site is really impacting." Hall is glad she completed this program, both for having earned school credits for finishing her certificate, and for the valuable life-changing experience of being in the work field.